The SBS A350 is a powerful 2.1 speaker system featuring advanced technologies that enhance your audio experience for your music, movies and games. 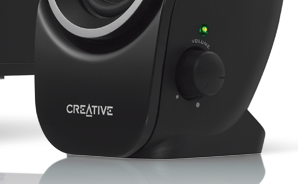 The Creative IFP improves sonic imaging for stunning audio quality, while the Creative DSE enhances bass response and loudness within a smaller enclosure, improving the overall frequency distribution. Bass level adjustment is integrated on the subwoofer to provide fine-tuning on bass performance. ENHANCE YOUR AUDIO EXPERIENCE WITH THIS POWERFUL 2.1 SPEAKER SYSTEM! Get more punchy bass out of your movies, games and music with the A350! 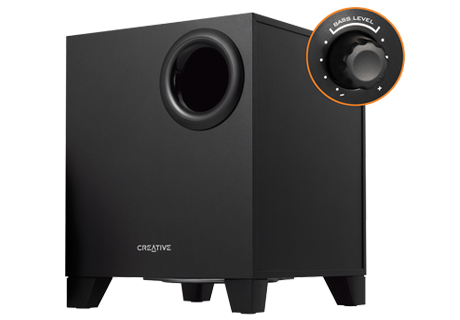 The 2.1 speaker system comes with a powerful down-firing ported subwoofer that delivers powerful bass in your audio. The A350's satellites are designed to give you more mid bass, despite their compact housing, thanks to the Creative design. With the port tube separated into two separate slots, the A350 reaps the benefits of having one long port tube that delivers louder playback, improving frequency distribution of the system, as well as saving space on your desktop. The Creative IFP feature in the A350’s satellites incorporates improved flares surrounding the drivers. 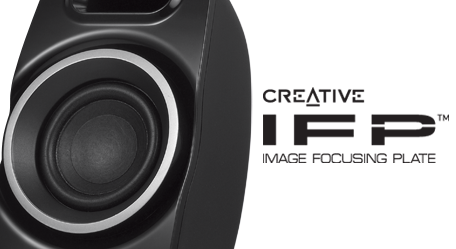 The IFP provides a wider acoustic sweet spot and improves sonic directivity and imaging to the listening area, thus giving your music more focus while preserving its tonal accuracy. Simply adjust the system’s bass to suit your taste! The ON/OFF switch, integrated with the volume control knob, is conveniently located on the right satellite for easy access.